This seven night small group tour of China takes travellers on a whistle-stop train tour of three of the country’s big hitters: Beijing, Xi’an and Shanghai as well as time spent in the lesser-visited city of Suzhou. 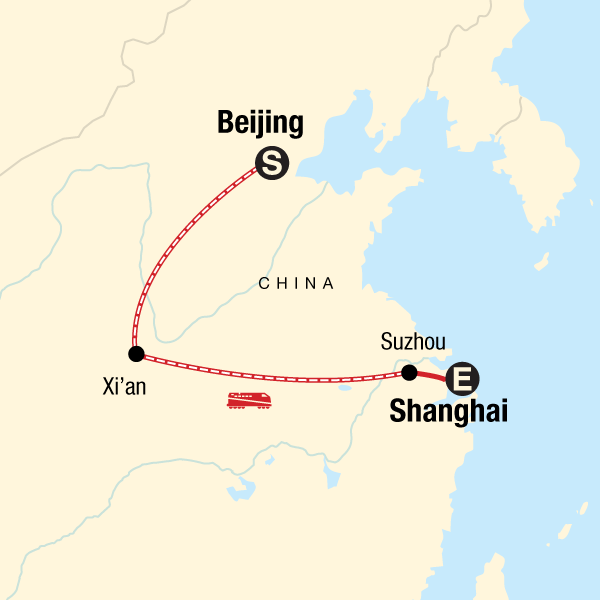 Train travel offers an efficient and authentic means of experiencing China with one overnight journey - from Xi’an to Suzhou – allowing for an exciting adventure midway through the tour. Starting in burgeoning Beijing you’ll visit the Forbidden City, Tiananmen Square and the Great Wall of China before boarding an express train to Xi’an so as to catch a glimpse of another of China’s most iconic symbols: Emperor Qin Shi Huang’s Terracotta Army. Heading east to the classic UNESCO-listed gardens, lakes and pagodas of Suzhou is a real treat and provides an excellent example of ancient architectural style prior to moving on to the contemporary visions of Shanghai harbour reflected in the Huangpu River. This 8 day tour combines overland travel with guided sightseeing and independent exploration to ensure time spent in China is time well spent. As well as taking care of all the day-to-day practicalities, your group leader is the one who will turn your trip into an adventure. Leaders are extraordinary characters – the kind of person who has spent 14 Christmas days on the slopes of Mount Everest, runs marathons wearing tiger suits to raise funds for their conservation and thinks nothing of leading an overland trip in Sudan or Afghanistan. Fearless and inspiring, group leaders are as important as the destination itself. No matter how experienced your group leader, they can never make up for the knowledge gained from a lifetime in the destination. That’s why many of our trips work with local guides around the world – who invite you into their homeland with pleasure. As well as doing crazy things like climbing Kilimanjaro 100 times, they also donate their time to local projects supported by travellers – such as rebuilding Sri Lankan villages following the 2004 tsunami. Low Impact Transportation: This trip gives you the chance to try out the public buses, overnight sleeper trains to go from Xi’an to Shanghai and the famous rickshaws. Getting around as the locals do not only allows you to experience the culture on a deeper level, but the same way it is at home, using public transport is the most sustainable way to go – after walking and cycling of course! Supporting local culture and businesses: There are a multitude of opportunities to support local businesses and immerse yourself in Chinese culture on this trip. From the colourful markets to the bustling food stalls and cafes, the choices for eating and handicrafts are endless and the money is staying in the local economy - a vital way for tourism to make a positive impact. Activities that take you to markets, locally-owned restaurants, locals’ homes and villages are vital to the local peoples’ ability to truly benefit from tourism. Our style of trip, travelling, eating and staying with the locals, puts you right at the heart Chinese culture. China’s multi-ethnicity is evident in the Muslim Quarter. In Xi’an you can visit one of the oldest and best-preserved mosques in China. This is probably one of the few mosques in the world that incorporates a mixed architecture of traditional Muslim and Chinese styles. It may not be apparent that learning about and respecting other cultures is part of being a responsible traveler, but we believe that this discovery is a natural way for people of all backgrounds, nationalities, and religions to interact and learn from each other, fostering peace and understanding. And it’s just plain fascinating! Other optional unique experiences on this trip that allow you to support the local economy and learn about Chinese culture include: Hutong Tour in Rickshaw (Beijing): Take a rickshaw tour through the hutongs and discover the old world of Beijing, stopping by for lunch at a local family's home. Truly an authentic experience! A visit to Suzhou, a network of canals, bridges and canal-side housing, Venice of the East and Shanghai where you can enjoy a Bund walking tour and the Chinese Acrobat show. Tai Chi in the Park: Rise early and join the local for a lesson on Tai Chi in the nearby park. Travelling on local transport was a great experience. Great CEO and good selection of additional activities. Really enjoyed the overnight train trip. Best meal was cooked by local farmer & his wife. Overall a great trip. Can't wait to book next trip. Be aware that even hotel staff and tourist information desk at Beijing Airport won't be able to speak any English. Get a card from the hotel with their address written in Chinese before you travel. Watch video on Youtube how to buy ticket from machine for Airport Express in Beijing. Ditto Metro system. Yes. Using local transport & local restaurants & not just hotel facilities. Brilliant holiday. Great CEO & great people in our group. Would repeat if given chance ...or look to having a 28 day tour. Lhasa was absolutely magical, seeing the Potalla Palace for the first time from the roof top bar of the hotel was breath taking. this should not detract from a fabulous trip. Not really applicable in China. Loved the real Tibetan hotel in Lhasa. Excellent trip but would have preferred it in cooler temperatures.